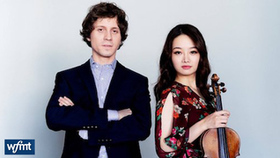 It began as a one-sided encounter – Rafał Blechacz was watching television and spotted Bomsori Kim as she was taking part in the 2016 International Henryk Wieniawski Violin Competition, one of the most important such contests for exceptional young violinists. His opinion that she was one of the most talented of the participants was echoed by the jury, who awarded her second prize. By coincidence, Blechacz was looking for a chamber music partner at the time for a new project he was working on. "I sent her an email," he recalls, "and luckily for me, she accepted my musical invitation." 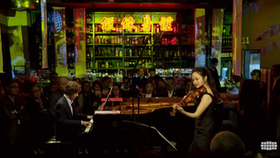 For her part, Kim was astonished to receive Blechacz's message – after all, his sensational victory at the 2005 International Chopin Competition had seen him join the ranks of the world's leading pianists. A great admirer of his musicianship, Kim had been particularly impressed by his DG album pairing works by Debussy and Szymanowski. The duo decided to explore the music of those two composers further on their first album together, and to add works by Fauré and Chopin to the mix. Blechacz brings a captivating structural clarity and wealth of tone colour to their chosen repertoire, while Kim reveals an unerring instinct for the poetry and rhapsodic nature of these works. The album opens with Fauré's First Violin Sonata, one of Kim's favourite examples of the genre. "It's always been my dream to perform it with an outstanding pianist such as Rafał," she says. In this richly varied work, the violin is called on one minute to "sing" a lyrical barcarolle, the next to play with gossamer lightness, while according to one of Fauré's contemporaries, the finale calls to mind "a gypsy improvisation with its almost barbaric power". The sonata, written in 1877, is clearly influenced by both Schumann and Berlioz, but also looks ahead to the shimmering, impressionistic soundworld of Debussy, whose own Violin Sonata, in G minor, is the second piece on the album. Despite its relative brevity, this is a multi-layered composition, notable for its wide-ranging moods, with reminiscences of Brahms as well as echoes of Spanish and Hungarian music. This was the last work Debussy completed, and he made his last public performance at the keyboard giving its premiere in May 1917. Rafał Blechacz has long been closely associated with the music of his compatriot Karol Szymanowski: his Deutsche Grammophon recording of the Piano Sonata, op.8 received widespread critical acclaim. He has also given many performances of the Violin Sonata, which Szymanowski wrote in 1904 when he was only in his early twenties. The sonata anticipates the audacious melodic writing of his later works – as Blechacz points out, "it's full of character and displays a wealth of different emotions". The album closes with a work originally written for piano solo: Chopin's melancholic Nocturne No.20 in C sharp minor, which the pair perform in legendary violinist Nathan Milstein's transcription for violin and piano. The recording marks the fulfilment of another dream for Bomsori Kim, who had always wanted to play Chopin's music on the violin. Winner of the 62nd ARD International Music Competition, Bomsori Kim is internationally regarded as one of today's most vibrant and exciting violinist. Bomsori received astonishing success at the 15th International Henryk Wieniawski Violin Competition, winning both Second Prize and Critic's Prize, as well as nine additional special prizes. In season 2018-2019, Bomsori will be „Artist-soloist–in-residence" at Poznan Philharmonic Orchestra. The residency will include concerts in Poznan, Berlin (Konzerthaus), Milan (Auditorio di Milano) and Prague (Smetana Hall). Bomsori will make her European Festival debuts at Dvorak Festival Prague (Rudolfinum), Lucerne Festival, Rheingau Festival, Heidelberger Frühling and Gstaad Festival. Bomsori will also perform for the first time with Tonkunstler Orchestra Vienna and she will make her debut at Suntory Hall Tokyo with Yomiuri Nippon Orchestra. Bomsori will be also on tour in Europe, Asia and USA with Polish pianist Rafal Blechacz. North American highlights of the season include her debut performance with the Lincoln Symphony Orchestra and recital appearances at the Maestro Foundation and La Jolla Music Society's Rising Star Series. As a soloist, Bomsori has appeared at numerous venues worldwide, such as Musikverein Golden Hall in Vienna, Tchaikovsky Hall in Moscow, Philharmonic Hall in St. Petersburg, Finlandia Hall in Helsinki, the Herkulessaal and the Prinzregententheater in Munich, Berlin Philharmonic Chamber Hall, Rudolfinum and Smetana Hall in Prague, and Seoul Arts Center Concert Hall. Bomsori has had the privilege of performing under the direction of multiple conductors, including Jaap van Zweden, Andrey Boreyko, Jacek Kaspszyk, Marin Alsop, Hannu Lintu, Sakari Oramo, John Storgards, Yuri Simonov, Giancarlo Guerrero, Yoel Levi, Antonio Mendez, Lukasz Borowicz with numerous leading orchestras, such as Bayerischer Rundfunk Symphony Orchestra, Moscow Symphony Orchestra, Montreal Symphony Orchestra, National Orchestra of Belgium, Warsaw National Philharmonic Orchestra, NDR Radiophilharmonie of Hannover, Poznan Philharmonic Orchestra, Finnish Radio Symphony Orchestra, Helsinki Philharmonic Orchestra, Munich Chamber Orchestra, Yomiuri Nippon Symphony Orchestra, KBS Symphony Orchestra, amongst others. In 2017, Warner Classics released Bomsori's debut album with maestro Jacek Kaspszyk and the Warsaw Philharmonic Orchestra, featuring Wieniawski Violin Concerto No.2 and Shostakovich Violin Concerto No.1. Her second album with pianist Rafal Blechacz will be released in 2019. A native of South Korea, Bomsori received a Bachelor's degree at Seoul National University, where she studied with Young Uck Kim. She also earned her Master of Music Degree and Artist Diploma at The Juilliard School as a full-scholarship candidate and studied with Sylvia Rosenberg and Ronald Copes. With the support of Kumho Asiana Cultural Foundation, she currently plays on a 1774 violin by Joannes Baptista Guadagnini. 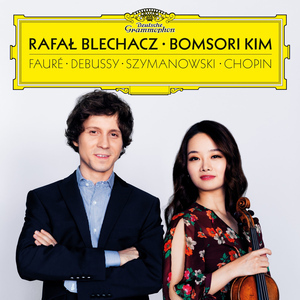 For his first ever chamber music recording on Deutsche Grammophon, pianist Rafal Blechacz teams up with Korean violinist Bomsori Kim. Polish melancholy and French elegance have a wonderfully symbiotic relationship in music, famously illustrated in the works of Frédéric Chopin, a composer who was Polish by birth and settled in France. 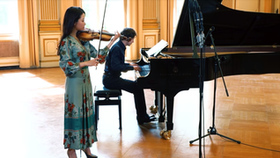 For their first album together, Kim and Blechacz perform gems from both countries, including works by Fauré, Debussy, Szymanowski, and of course, Chopin.